Users of online marketplace Uniiverse will soon have a new tool in their web commerce arsenal – online ticketing. A Toronto-based startup, Uniiverse operates an online marketplace where users can buy and sell items and services, host events, and even apartment sharing. The site hosts the listings, manages sales and processes payments. It makes its money by charging a small transaction fee to each buyer. For example, currently a sushi making class is being offered by one seller, while another is offering professional makeup services. On June 11, the company is adding a new feature: a custom iOS app called Ticket Manager. 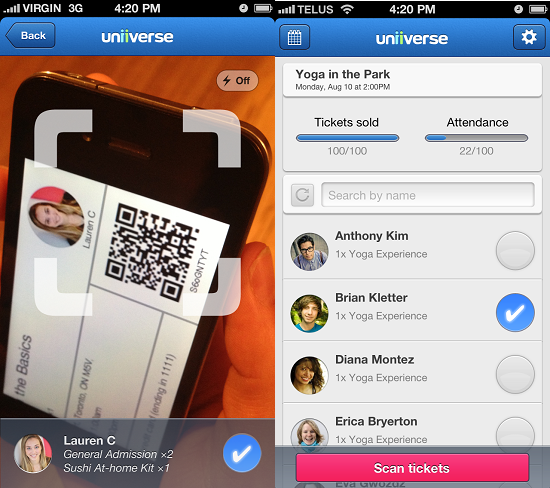 It allows event organizers to issue event tickets through the Uniiverse marketplace, and then check-in ticketholders at their event using an iPad or iPhone running the Ticket Manager app, instantly validating the ticket and feeding the information back into Uniiverse. According to Jaclyn Klein, community manager for Uniiverse, the new app was created to support and pivot towards the site’s power users, and will be offered to sellers free of charge.